This trilogy is utterly brilliant! 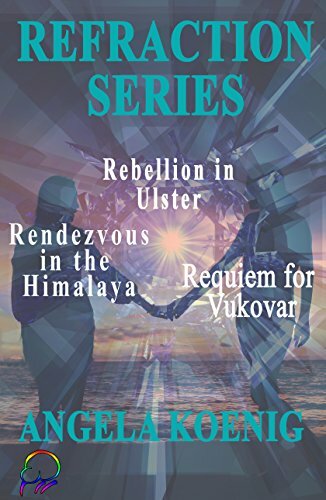 Angela Koenig has written a gripping series of novels following Jeri O’Donnell from the troubles in Ulster, to the Himalayas and onto Yugoslavia when the Balkan war was in full force. Her life is one of violence, tragedy and keeping hidden from those out to capture her. When she meets Kelly Corcoran, an American tourist seeking peace, she finds a love that changes her. Their connection was intense, beautiful and at times frantic and joyful. Can they survive the dangerous life they lead? Is love enough? The writing was intelligent and poetic and managed to convey a sense of history that pulled me into the story and made me feel as if I was right in the midst of it all. Jeri is a very complex character and her journey is one that I am so glad I followed. The love story woven throughout is deep and vital and one I won’t forget. I highly recommend this trilogy and wish I could give it more than 5 Stars. I was given this ARC by Affinity Rainbow Publications in return for an honest review. I know this is such a brilliant little known gem!